Creativity at its finest! Boat parts as instruments. One of the biggest lessons I’ve learned since this new chapter began is that plans and schedules are for the birds. Anything that’s not based first on the weather, second on boat preparedness and third on finances is quickly scrapped. And our sanity fits in there somewhere, too :). Based on my last post, the plan was to stay in Fort Pierce for a few days and then continue heading north, with the next stop being Port Canaveral. I was jazzed about this plan. Finally, Clarity could spread her wings! We wouldn’t be tied to a dock! We’re tied to a dock. And here’s why. 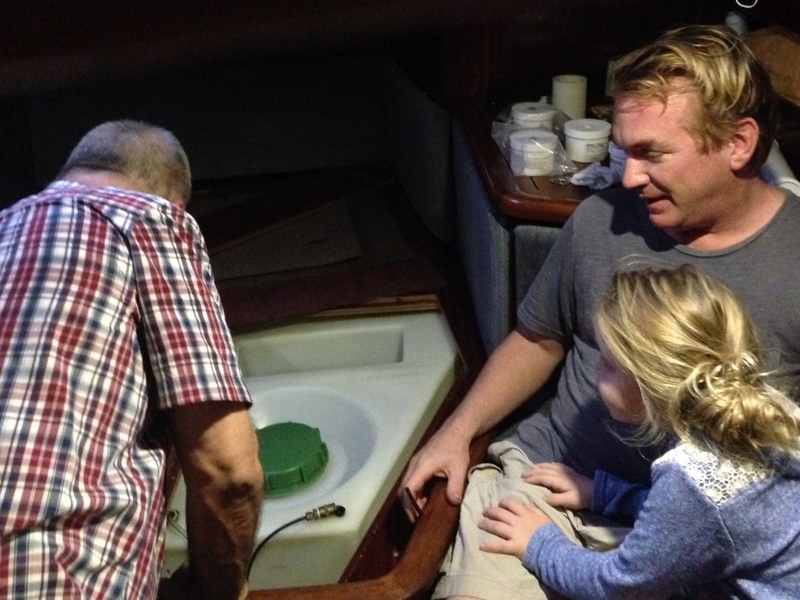 Once we guided Clarity in safely after that full-day sail last week Thursday, Aaron and I were tired, both from the sail and from all the prep the days before departure to get the final necessary boat projects sorted to move her. We spent Friday and Saturday exploring town and Saturday night, we started looking more in depth into the forecast for a Monday or Tuesday departure. Sure, sunny skies (with occasional passing showers) were forecasted all week. But a comfortable sail relies on a lot more than that. For Monday and Tuesday, the seas would be calm, but the wind was forecasted to blow straight from the north, which means we would have been fighting it the whole way up the coast, and Port Canaveral is about a 14-hour sail from here. From Wednesday on, the wind was more favorable, but the seas would be kicked up to 4-foot waves. As Claire and I get acclimated, we’ll be able to handle these fine, but this early on, we’re just not there yet, so likely she or I or both of us would be sick. I like to avoid that whenever possible. You may also remember from my previous posts about Riviera Beach that here in Florida, once you’ve paid the transient rate for about seven or eight days at a marina, you’ve paid for the month. That’s just how it works. So, if we left after the seas calmed down some, we’d be leaving and paying the transient rates at these new marinas while this slip that we already paid for for the next three weeks would be sitting vacant, and with this lifestyle, we just couldn’t justify that. So, after a day or two of going back and forth, we signed the contract. Harbortown Marina is our home for the next three weeks, and this past week has proven in spades that it was the right decision. 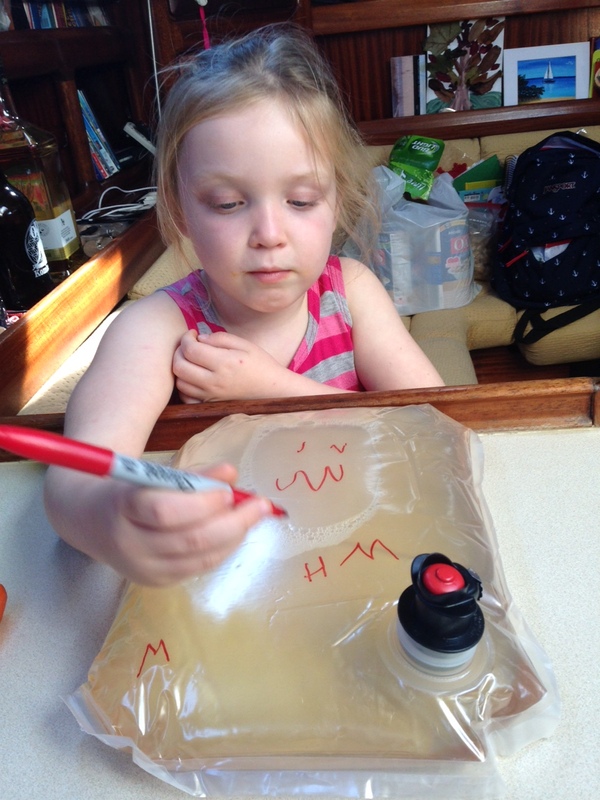 First, it allowed us to take the throttle off the long list of boat projects that still need to be done and do them at a more leisurely pace, and while we weren’t also trying to make headway north. We work on the boat every day, but we have time to play, now, too, and not feel like every minute we’re spending family time, we’re getting behind. This also allows us some time to practice, both with the dinghy and with the boat itself. I’m getting more comfortable launching and driving the dinghy myself, and in the next few weeks, we will practice anchoring the boat in some of the protected coves here in the ICW, so that when we do head north, we can stay on the hook in a few of the ports and save the transient dockage fees. 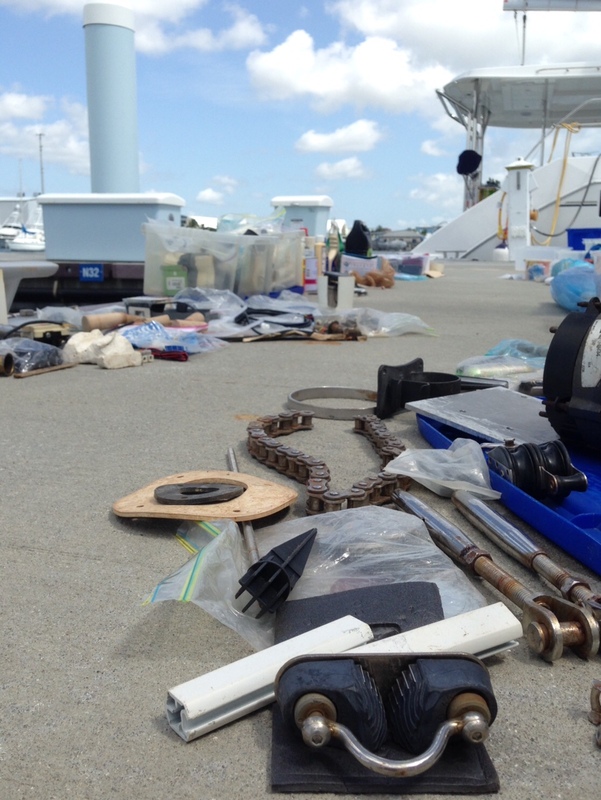 Harbortown is also a lot more comfortably equipped than our last marina. We have a pool right at the end of our dock, really nice (and CLEAN!) showers, and a boater’s lounge with desks, couches, and games and books for Claire. It’s also a safe marina, meaning that if a hurricane does develop, we can leave our boat here (if you’re not in a designated safe marina, they kick you out). And there’s a lot more that we can bike and dinghy to here in Fort Pierce – a quaint downtown, an aquarium, the local library, museums, beaches, islands, grocery stores, etc. We’ve also been able to establish more of a routine for Claire. Generally, we hang around the boat in the morning, having a leisurely breakfast before getting into reading/writing/crafting time until lunch or so. Aaron and I will trade off, one of us with Claire while the other tackles boat projects or work deadlines. 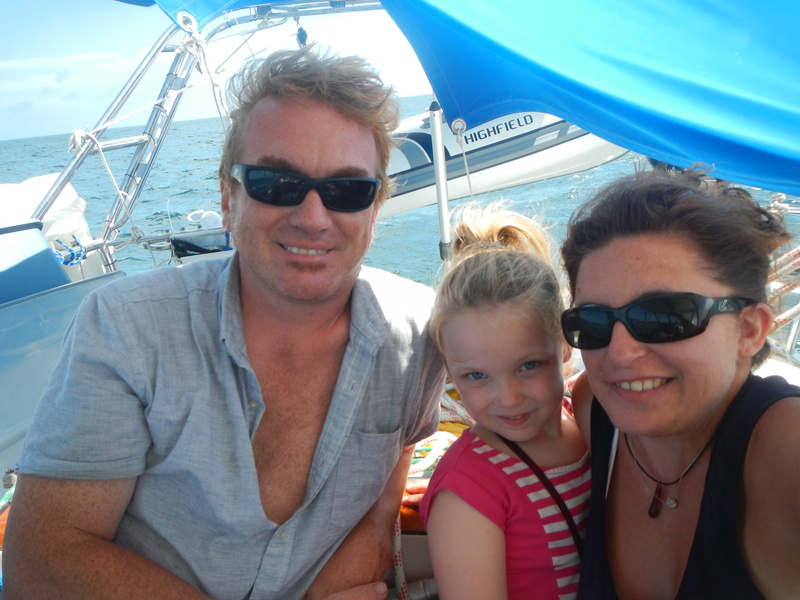 Then, in the afternoon, we spend time as a family, whether that means launching the dinghy and heading to town or a beach, or sticking around the marina and enjoying the pool and the lounge. We’re usually back on board in time for me to get dinner started. The cherry on top has been that a few days after we signed the contract, we met another liveaboard family just a few slips down on our dock. The couple is fantastic – warm, friendly, down-to-earth, fun. 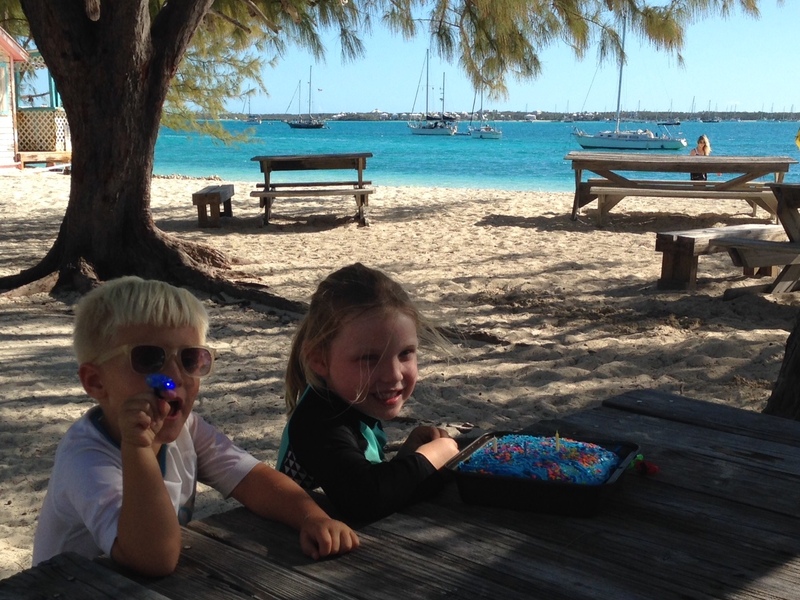 And they have a six-and-a-half-year-old son, Leo, who gets along great with Claire. They’re here getting their boat ready to head to the Caribbean about the same time we are, and it’s been such a breath of fresh air finally meeting some boating buddies and developing new friendships for the three of us. So where do we go from here? We are “definitely” heading north mid-September, port-hopping our way up the Florida coast to Brunswick, Georgia, right over the border. Since we bought the boat as out-of-state residents, we are required to vacate the state within 90 days of the purchase. 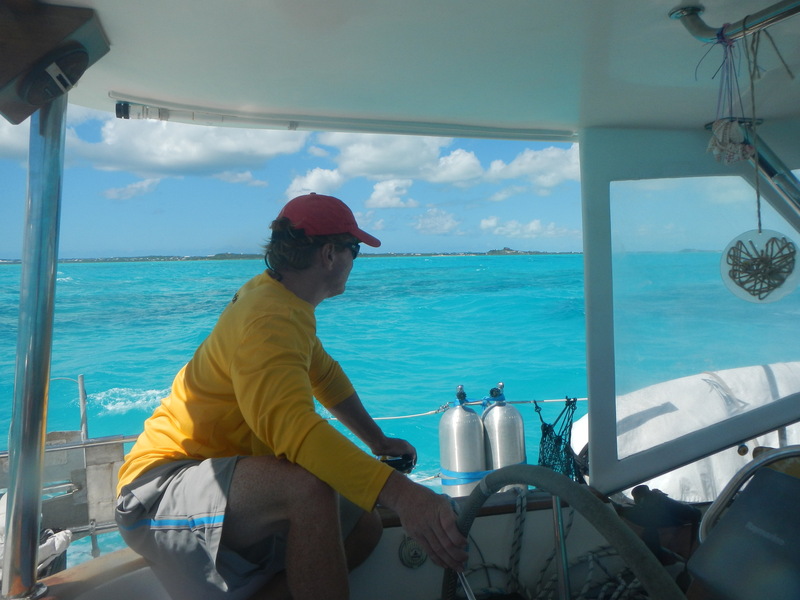 We’ll choose from a few safe-harbor marinas in the area and spend the month waiting out the rest of hurricane season and continuing to ready the boat before we make our way back south again and cross over to the Bahamas. Slowly but surely, we are settling in, and every day, it feels more and more like home. When life hands you a rainy day, make gak! On a dinghy ride through some of the mangrove forests, we found this abandoned ship. I think it’s been here awhile. This hermit crab was super speedy! I just barely got this shot. Pressure cooker success! Lime-coconut rice with fresh mango. Aaron troubleshooting the fridge, with Claire keeping her worker on task. I’ve been struggling for awhile with how to write this next post. Life transitions are hard – that’s not news – but how much should you share? Who wants to read something negative? But the more I’ve thought about it, the more I’ve reminded myself that positive or negative, people just want to read something honest. So here’s the truth. This has been really, really hard – much harder than we anticipated. It’s for reasons that we know are temporary, and circumstances that we know will improve – but day to day, we just keep hoping for more wins than losses. When we moved aboard three weeks ago (almost four now, wow! 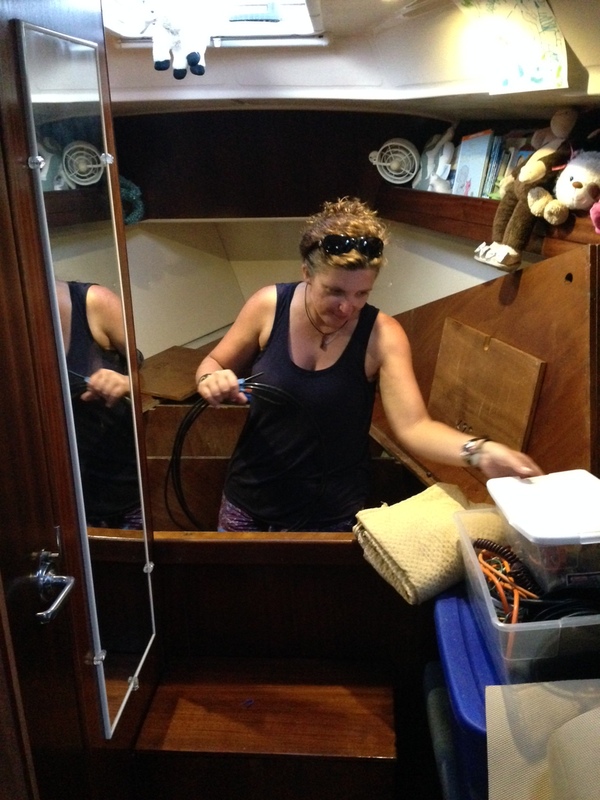 ), we unknowingly moved ourselves onto a boat that needed a big refit. Issues that we knew needed attention turned into bigger projects, new systems quit on us, problems that we thought we had fixed reoccurred. I say we, but Aaron has taken the brunt of this. As much as I need and want to learn all of these systems, right now, there isn’t time for him to be both teacher and engineer/mechanic. So he focuses mainly on executing, while I focus mainly on the daily running of the household. Just to name a few “challenges,” our new air conditioning quit on us multiple times. 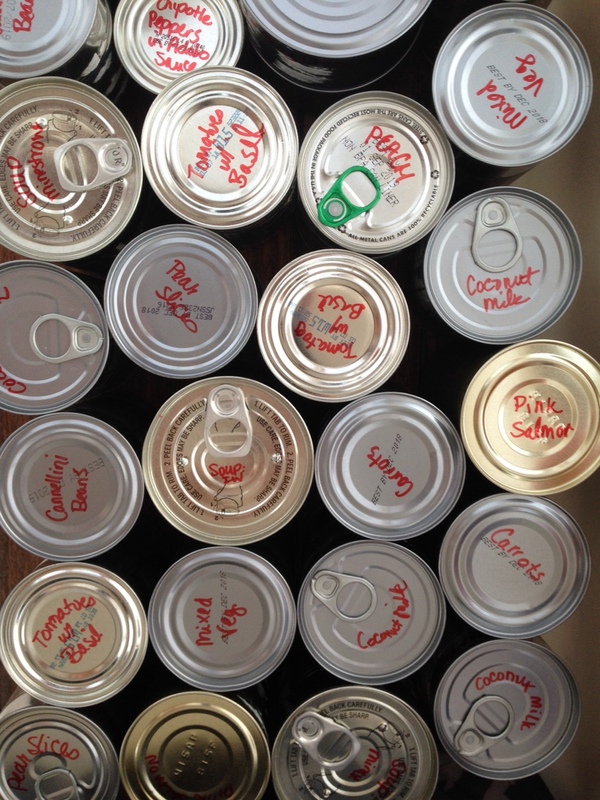 The refrigerator quit with a full grocery shop of food. The freezer seemed to be a lost cause. The shower didn’t work. Outlets were miswired and non-functional. We had a small water leak in the engine room, a fuel leak in the generator. The list goes on. For those of you who have lived through remodeling your own home, it’s like that – except that every time you need to fix or work on anything, you have to rip apart your entire living space to do it. With three people living aboard, it gets really cramped really fast. Imagine eating dinner in your woodshop, or working on the engine to your car in your bedroom. The previous owners left bins upon bins of old and replacement parts, leftover fabrics and materials, and more in the catacombs of storage under Claire’s v-berth. 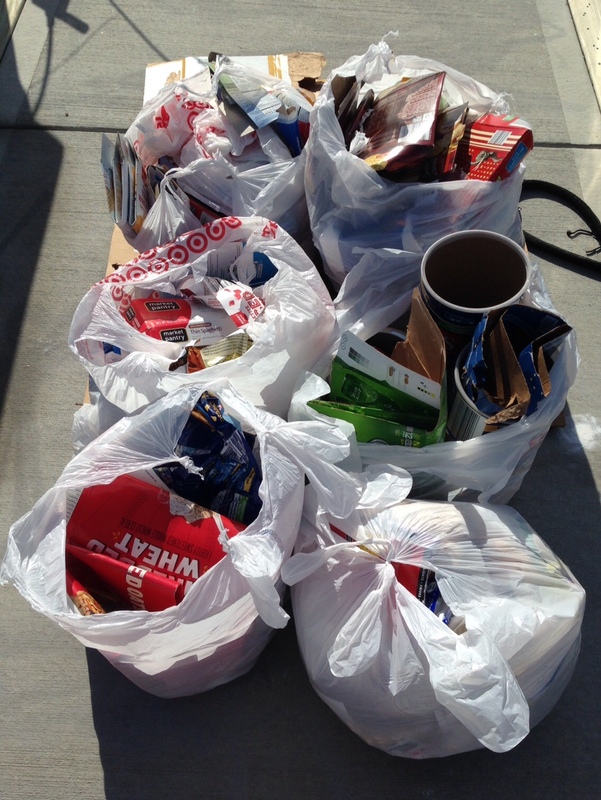 The only way to know what we had, what we needed, and what we could toss, was to haul it all out, one bin at a time. Once we pulled out the bins, we dragged them out to the dock and went through them piece by piece before cataloging it, repackaging it and hauling what was left back in. And it means that any free time that we don’t intentionally assign to down time gets sucked away just with solving problems – not to mention work deadlines, making meals, doing dishes and laundry. You know, life. We have never earned our sleep more, and never slept harder. The other part of the equation that’s been increasingly frustrating is our location. 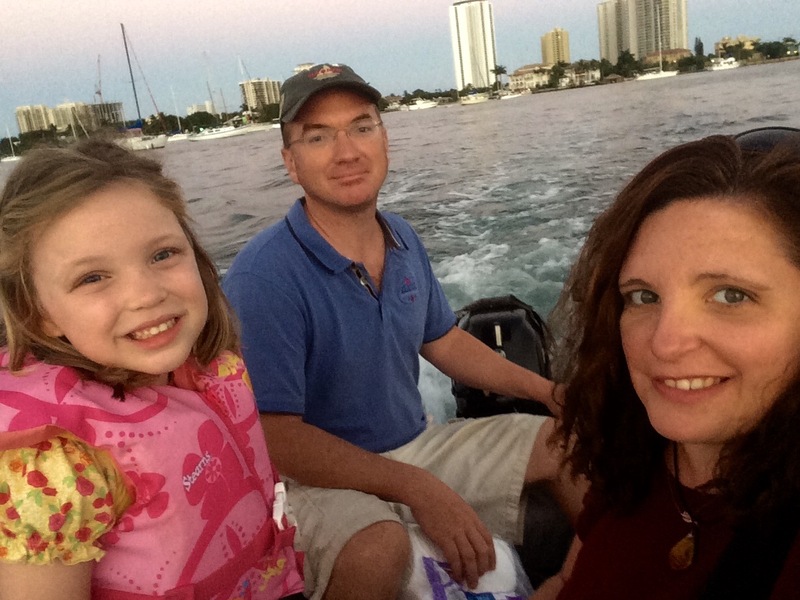 We absolutely made the right decision to stay here – we were 100% not ready to move the boat anywhere – but Riviera Beach has not been an easy adjustment, especially since we returned the rental car. There’s nothing within walking distance, and strangely enough, there really isn’t much within dinghying or biking distance either. So even when we find a window of opportunity to take a break, the options have been limited. It’s made the transition from our prior life to this one that much more extreme. If I’m being brutally honest, there have been moments when I’ve wanted to throw in the towel and just go back to what’s easy. Just moments, though. 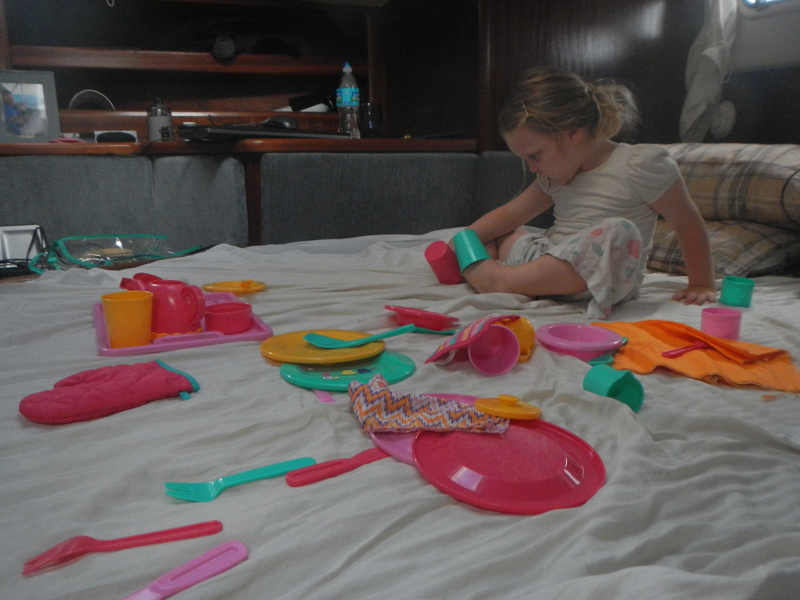 Our silly goose, having a tea party with her toes in our aft cabin while we make some progress on boat projects. I don’t mean to paint this all as doom and gloom – it’s certainly not. It’s funny – at least a few people have asked, “How is Claire doing with all of this?” The best of the three of us, by far. The weather gods have been quite grumpy the last few days, and I just realized this evening that she hasn’t been off the boat, except for right on our dock, in two full days, and you’d never know it with how happy she’s been. Sure, she’s used to someone playing with her all the time, be that classmates at school or friends during playdates, so she wants constant attention, and we are working on that. But for the most part, build that kiddo a fort and put out tea for her stuffed animals and she’s content. I’m trying to keep a positive attitude and remind myself that this is not what our life is going to look like. We will always have work that needs doing, it’s the nature of owning a boat, but it won’t be all-encompassing. 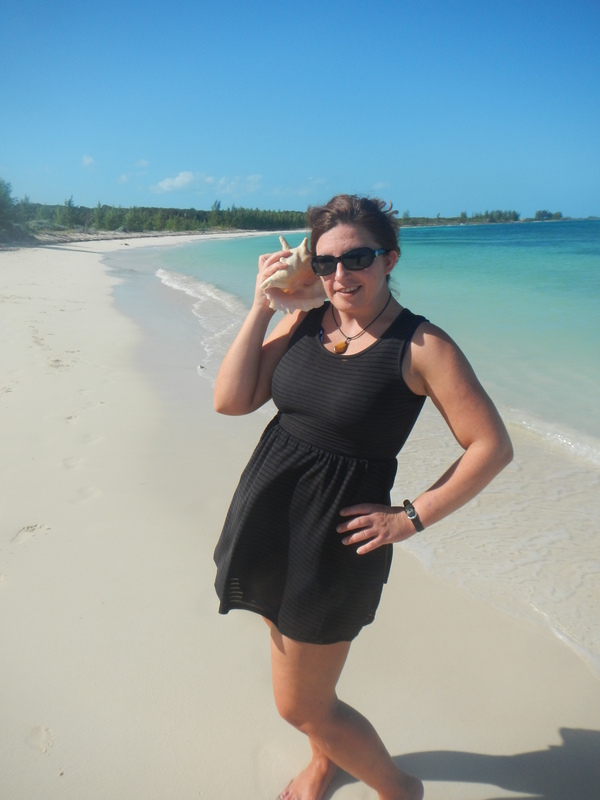 For me, the impetus of this life change was the adventure, traveling, meeting new people, taking to the sea! We haven’t even tossed the lines once yet. But we will, we will. We will get there. Slowly, the wins are starting to overcome the losses. The fridge and freezer are now working, the shower is finally working, leaks have been fixed. The air conditioning is running smoothly and we are just now getting to the point where we can put down-below projects on hold for a bit while we get the topsides ready for sailing. 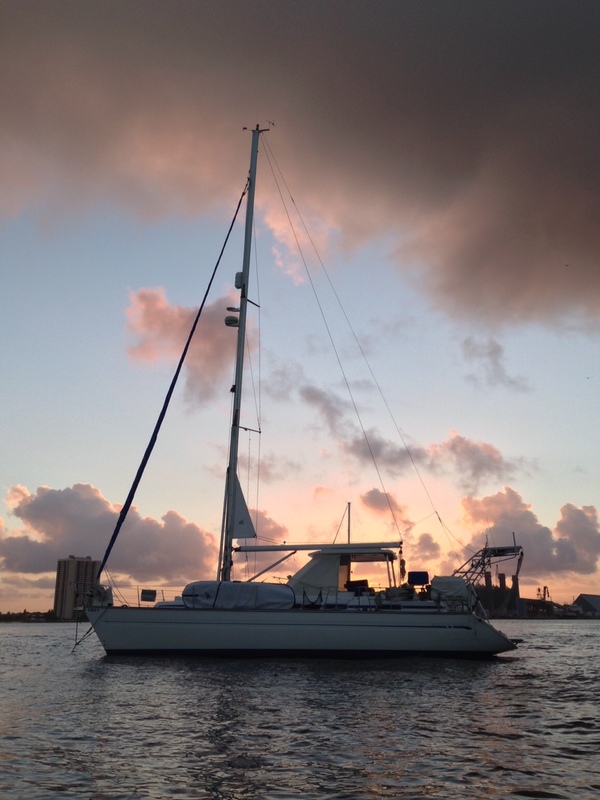 Our month here is up in a week and a half, and then we’ll cast lines, fill the sails and make our way up to Fort Pierce. Somehow, I just know that once I feel the wind on my face and the waves on our bow, I’ll be recharged, ready to tackle whatever comes next. Claire’s first taste of fresh coconut juice straight from the fruit. She immediately rubbed her belly in approval. Drip castles at nearby Peanut Island, the highlight of our current location. Every time I see these palm trees, I can’t help but see fireworks. On a stretch of the Intracoastal Waterway near our marina, the water gets so shallow during low tide that partiers set up a beach volleyball court. Claire has inherited my love of shells. She can sit and sort them for hours. Claire swam on her own for the first time a few days ago. Something clicked at just the right time, she remembered what she’s learned from classes and practice, and was brave enough to get over her fear. And once she started, she never went back. It happened in the middle of the day on Monday at a nearby pool, when Aaron normally would have been at the office all day. Except that he was there, encouraging her to keep swimming to him a little bit further, a little bit further each time. We were both there to see it. That’s one of the many reasons why we’re doing this – to experience these amazing life moments together. We’ve been here five days now (has it only been five days?! ), and we’ve already had some amazing highs. The lows have been there, too. 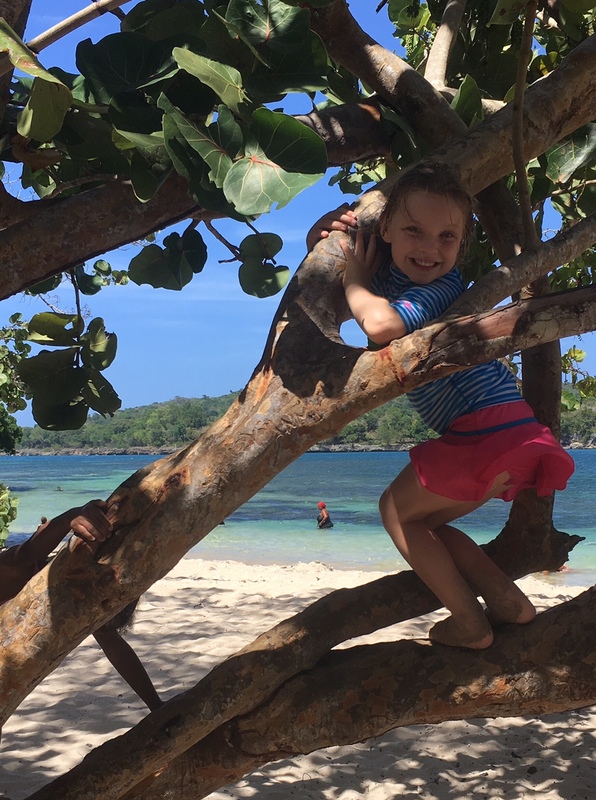 When we arrived at the boat, I was overjoyed and felt the same immediate sense of “this is home” that I experienced when we flew out to see her for the first time. But truthfully, those first three or four days, I was not at my finest. After the long road trip from Oak Park, we got here and immediately dove into unloading all of our life possessions from the rental van. In the grand scheme of things, we didn’t bring much, but in cruising terms, we had triple what we should have. We were again buried in boxes, and you all know by now how well I do with that. We’ve also shifted course a bit from our original plan to maintain our sanity (or find mine) and to not dive head first into absolutely everything at once (after all, isn’t moving across the country onto a boat enough for one month? 🙂 ). Originally, after getting here Saturday afternoon, we were planning to return the rental car on Wednesday and leave Riviera Beach City Marina, on the Intracoastal Waterway where our boat is docked, within a few days. We had our reasons and they were good ones – this marina is extremely expensive and with hardly any amenities, and we are still planning to head north to Georgia or South Carolina to wait out hurricane season. But the next logical port is about an eight-hour run away. We managed to get all of our boxes out of the van, but our things were by no means put away yet. Aaron and I both had work deadlines. 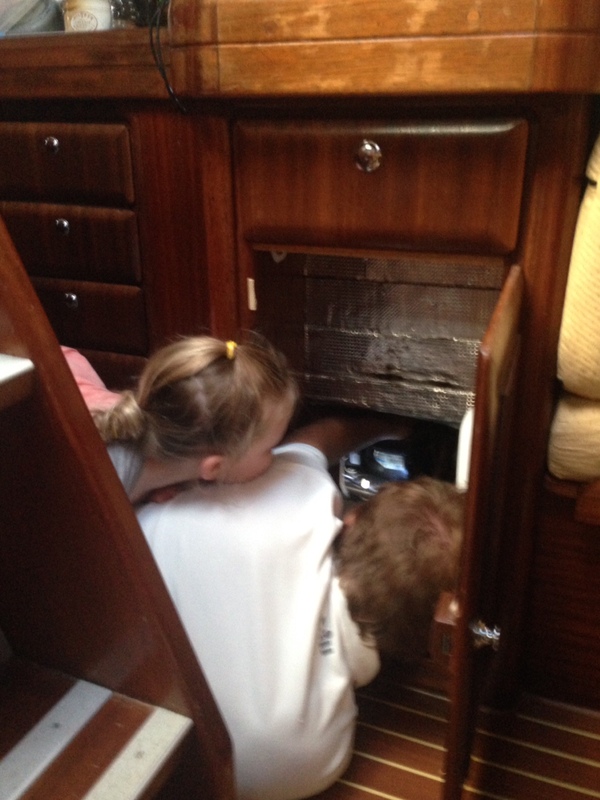 Boat issues had to be fixed (the air conditioner needed attention, there was a fuel leak with the generator, etc.) 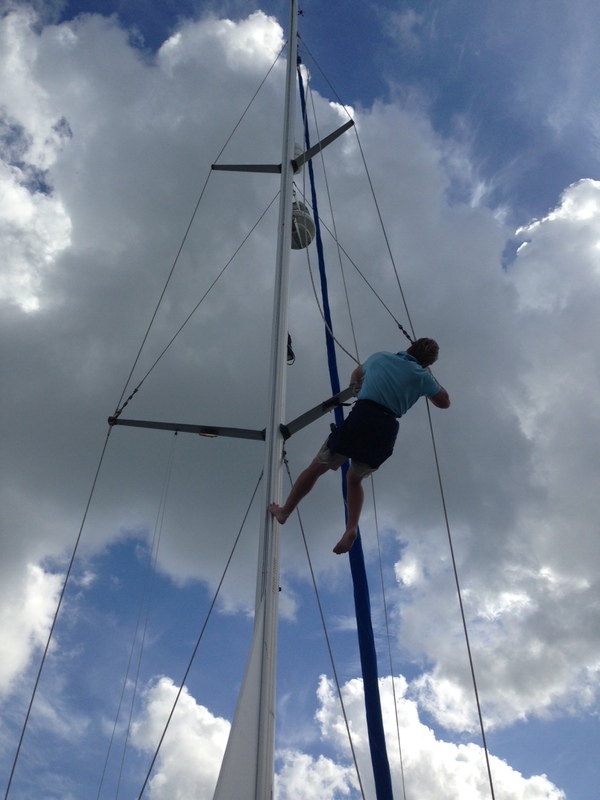 Not to mention the fact that we have had no time to get the boat off the dock, even for a short run to hoist the sails and check the engine. Oh, and we have a 4-year-old 24-7 now who needs our attention, too. It was all just too much pressure, and we thought, at least for this first month, let’s just give ourselves a break. We signed a lease for another month here (though we will likely leave sooner than that), and since there’s not really anything in walking distance here, we thought, what the heck, let’s just rent a car for another week. Sure, all of these decisions amount to more money than we were planning to spend this month. But sometimes, you have to make a decision based on what’s best for the family. There’s plenty of time for us to settle into this lifestyle a bit more gradually. It’s been a trip, to be sure, but as I mentioned, there have also been unbelievable moments of joy. Like when Claire lit up in a monster-sized grin when she saw her room for the first time, or when she felt the ocean on her feet for the first time. Like when she swam on her own, or when we drove to the local snorkel/scuba outfitters and got gear for the whole family. 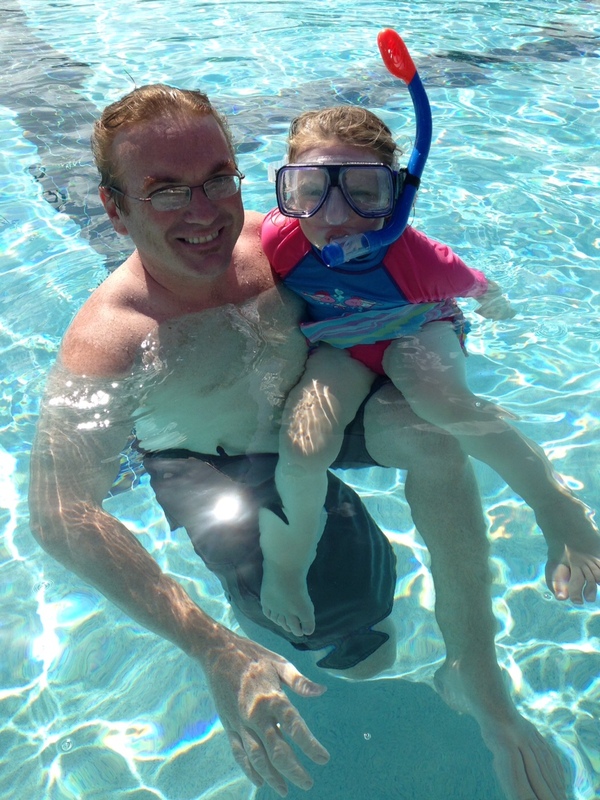 We immediately went to the pool to have her try out her mask and tube, and right away, swimming underwater opened up a whole new world for her that she refused to leave all afternoon. 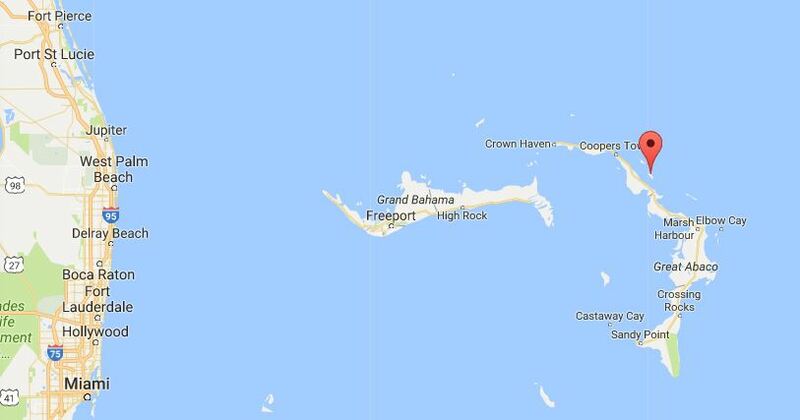 There’s a highly rated snorkeling spot called Peanut Island almost spitting distance from our boat, and we’re planning to head there in the next few days. We drove to a nearby pool for a little break from unpacking. A celebratory shake for our new little swimmer! Chasing and running from the waves – endless fun! Our first craft on board – soft play-doh made from corn starch and conditioner. 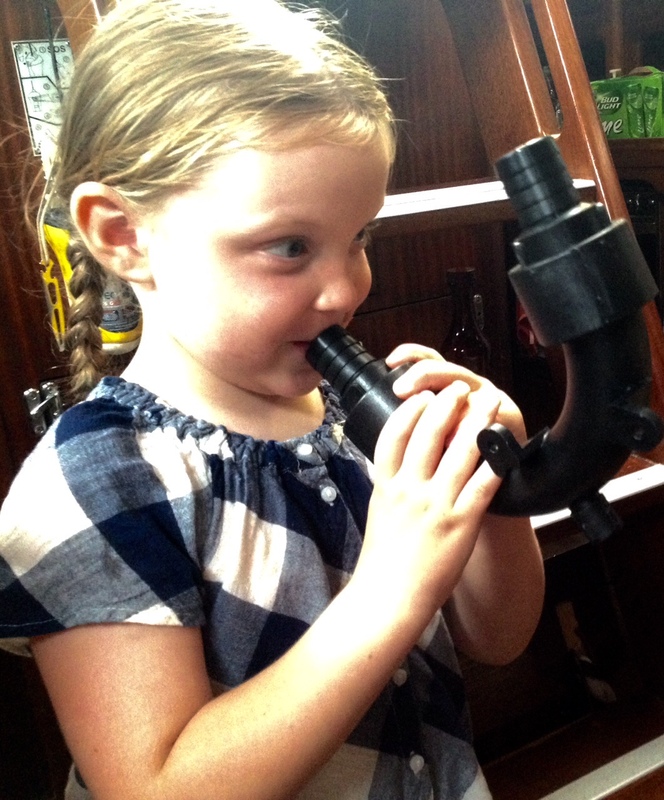 It kept Claire happy and entertained while I set up the galley! We just found this splash pad a short walk from our slip. Pretty sure it will be a daily destination. With more of the unpacking done, Aaron was able to set up the amazing shade canopies that came with the boat. 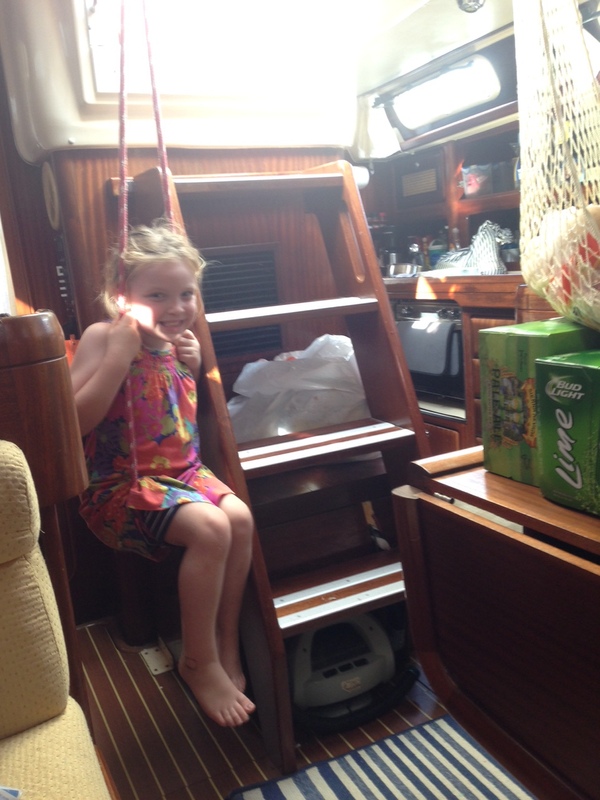 He also mounted the hose so Claire had her very own sprinkler on deck.